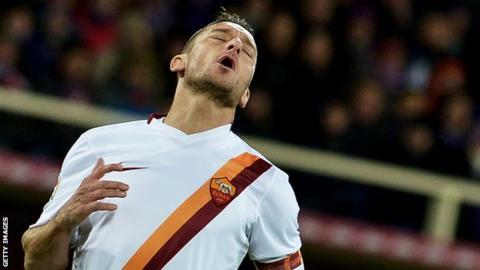 Roma lost further ground in the Serie A title race as a draw at Fiorentina left them seven points behind leaders Juventus. Rudi Garcia's side were second best in the first half in Florence and fell behind to Mario Gomez's neat finish. The visitors improved after the break and drew level through Adem Ljajic's close-range strike. But their inability to find a winner only enhanced Juve's title prospects as The Old Lady beat Chievo 2-0 on Sunday. The Scudetto rivals meet in five games' time, but Roma will need to drastically improve their form if they are to keep the pressure on the reigning champions. The Giallorossi have now drawn four of their last five Serie A matches, in contrast to Juventus, who are on an 11-game unbeaten streak in the league, which has seen them win their last three matches. Roma's predicament worsened as they lost influential midfielder Kevin Strootman to a suspected knee injury in the first half, not long after Gomez had doubled his goal tally for the season by steering David Pizarro's low drive into the net to give the home side the lead. To their credit, Roma showed fight to regain parity in the match courtesy of Ljajic, who scored from Juan Iturbe's pass, but they ran out of ideas later in the game and had to settle for a point. After the game, Roma coach Garcia said he believes Strootman's injury is "not too serious". "We hope he will be okay because he's an important player for us. We'll see tomorrow," said the Frenchman. Dutch international Strootman, 24, only returned to the Roma team prior to Christmas having missed the end of last season and the 2014 World Cup with a knee injury suffered in March last year. Match ends, Fiorentina 1, Roma 1. Second Half ends, Fiorentina 1, Roma 1. Juan Guillermo Cuadrado (Fiorentina) is shown the yellow card for a bad foul. Foul by Juan Guillermo Cuadrado (Fiorentina). Attempt missed. Alessandro Florenzi (Roma) right footed shot from the right side of the box is too high. Assisted by Mapou Yanga-Mbiwa. Corner, Fiorentina. Conceded by Morgan De Sanctis. Attempt saved. Nenad Tomovic (Fiorentina) right footed shot from the right side of the box is saved in the bottom right corner. Assisted by Jasmin Kurtic. Substitution, Roma. Maicon replaces Adem Ljajic. Offside, Fiorentina. David Pizarro tries a through ball, but Juan Guillermo Cuadrado is caught offside. Juan Guillermo Cuadrado (Fiorentina) wins a free kick on the left wing. Hand ball by Khouma Babacar (Fiorentina). Substitution, Roma. Mattia Destro replaces Francesco Totti. Attempt missed. Jasmin Kurtic (Fiorentina) left footed shot from outside the box is high and wide to the left. Assisted by Joaquín. Foul by Francesco Totti (Roma). Juan Guillermo Cuadrado (Fiorentina) wins a free kick in the attacking half. Attempt missed. Juan Iturbe (Roma) left footed shot from outside the box is too high. Assisted by Radja Nainggolan. Attempt missed. Adem Ljajic (Roma) left footed shot from the left side of the box is just a bit too high. Assisted by Juan Iturbe. Offside, Fiorentina. Juan Guillermo Cuadrado tries a through ball, but Mario Gomez is caught offside. Substitution, Fiorentina. Marcos Alonso replaces Manuel Pasqual. Attempt saved. Borja Valero (Fiorentina) left footed shot from outside the box is saved in the centre of the goal. Assisted by Jasmin Kurtic. Attempt blocked. Jasmin Kurtic (Fiorentina) left footed shot from the centre of the box is blocked. Assisted by Joaquín. Substitution, Fiorentina. Jasmin Kurtic replaces Matías Fernández. Vexed Mexes: Europe's angriest footballer?